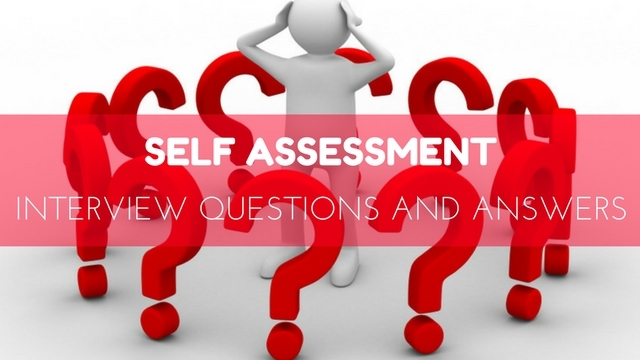 The process of self-assessment includes honestly answering a number of questions that are important to help you judge your characteristic set of skills that show your readiness for the life ahead. However, at a self-assessment interview, the interviewers will not ask questions that highlight your positive aspects but also the negative aspects that you have to overcome for best results. The questions for self-evaluation are usually based on your development as a character. It is basically to test you out on the clearness of thought and honest idea about the self or it is a basic self-assessment test. Motivates and encourages individuals to take initiatives. Helps you develop critical thinking. Decreases the evaluation workload on teachers. Guides to consider your decision taken and their outcomes. Helps you make better future plans. They turn frank and honest to evaluate themselves regarding their performance. The following mentioned are few self-assessment performance review questions along with their work self-evaluation answers. When the interviewers ask this question, the answer has to be in terms of what kind of a person you are and not how you aspire to become. Honesty during the interview is the best way to determine the best outcome. On answering this question think about your general characteristics in real life and what people turn to you for. In everyone’s life, there are instances when people have asked for help. This means that people know what they can rely on you for. If you can recall something like that taking place, then you surely are in the good books where people trust you with problems they themselves cannot solve. You cannot expect the world to let you keep playing on your strengths so you had to better find a way to come to terms with your weaknesses. The real problem people have nowadays is that they make themselves too comfortable in what they are used to and avoid and changes thrown at them as widely as possible. But it does not do well, to only be smug about your skills. A wise man knows that each day is different and life can take an unexpected turn any moment. And if you aren’t prepared for times like that you’d be thrown off balance. So accept your weaknesses but do not cower to them rather rise to challenge and emerge victoriously. 3. What gives you mental satisfaction? This is a very common question that you can expect to be asked by the interviewers. This is considered as a very important question for all candidates since inner peace is so hard to find. Even so, there has to be at least one thing or activity that makes you feel light in the head or relieves you from the onslaught of worrying thoughts. This is important because many a time in life, you will have to toil with matters that have gone out of hand. And having the means to find mental satisfaction is what will matter the most at the hardest of time. That is why the interviewers have to make sure that they are putting their work in the hands of a person who knows what he/she is doing. 4. Are you happy with your work? For this question what the interviewers actually mean and want to see is whether you take your work seriously. More often than not, employees are trenched for their lack of skills and interest than anything else. So it is important that you do your work sincerely even though it is not the ideal job for you. You have to respect the trust others put in you to work for them. If you are absolutely unable to be on easy terms with the demands of your work then you can take the matter to your employer rather than spoil your reputation with poor performance. At this question, you need to evaluate your answers to employee self-evaluation properly. 5. Can you describe yourself as a benevolent person? Some people are too self-centred and can only think about furthering their ends to be benevolent. Interviewers look for candidates who will act as a beneficiary to other candidates. This act of benevolence and sweet behaviour strengthens the bond between the candidates. Moreover, this also becomes a good lesson for all the new arriving employees and helps them to understand the importance of caring for the employees who come after them. 6. Do you show kindness in general? Kindness is not fishing out a meagre amount for a beggar. The meaning of being kind goes deeper than that. A kind person shows kindness on a daily basis and in an all-round way. Kindness is helping others at times of need even without they asking you. Being kind not only builds healthy relationships but also teaches you the art of making life-long friends. You can only defeat your enemies with kindness and love, such is the power of kindness. This aspect in a candidate is sought after by companies because all the transactions that are made are initially based on trust and the promise of friendship throughout the period of the contract and even after. 7. What are your achievements? The motive behind such a question is to know whether you are humble despite being aware of your achievements. Your achievements at work are not yours to appreciate. Achievements are for others to take pride in for you while you have to keep working even harder to achieve a bigger goal. To the interviewers, the humble roots show the integrity of a man or a woman. You can never be too proud of anything not just because that fosters jealousy among employees but also because it is mentally unhealthy. 8. Does your family support you? This is to know whether you have a smooth personal life. Sometimes employees suffer from having to toil with too much in their private life to see what is going on with the company. Companies do not want employees to be neck deep in their own trouble to deal with the matters of commercial and social importance. So make sure that your family understands your intentions are good and you are doing whatever you can to keep your family members happy. And to keep them happy you have to give them the time they want and deserve from you. Do not ever show work as an excuse because that will bear on your loved ones in a bad way. 9. Do you have high emotional intelligence? Having high emotional intelligence is very essential nowadays to get a job done. You cannot expect to do all your work based on the facts given to you by your employer. You may need to join ends on an emotional connection that you share with people. Emotional intelligence helps you to form a relationship that is next to impossible if you are too uninterested to turn an ear to other people’s stories. As employees, you are expected to build relationships based on sharing of stories and empathy that bring you closer to people. Without it, working becomes harder than usual since you won’t be able to communicate with people except on a formal level which is not enough. There can be two reasons as to why the interviewers would have to ask such a question. The first reason would likely be to gauge your likelihood, towards making plans for the future. Companies expect to see a provider in their employees and like all providers employees ought to show promise of a profitable future. Secondly, they most probably want to know whether you tend to leave the company in the near future on better propositions. Therefore it comes down to judging the loyalty you owe to the company that hires you. Making false promises to be with the company even if you are likely to leave at the slightest hint of a better offer from any other place is not going to end well for you, in terms of the recommendations you would need while applying to another company. 11. How are you valuable to your company? The answer to this question literally determines the result of the interview and ultimately your selection. The company by asking this question prods you to convince them to accept you. If you have nothing special to offer other than what every normal employee would do in your position, then you are not giving them enough reasons to hire you. Therefore, you have to think through on why the company should hire you and what special attributes make you more eligible to be preferred to others. 12. How do you handle a tough day at work? Apart from being talented employers look for resilient workers. Workers who would find a way through a tough day’s work. You have to ask yourself if you are giving the employers enough reason to hire you. And the one thing that can go a long way in sealing the deal is making them believe that you will work even harder in the face of a challenge. But before you say that, make sure that you mean it in your mind. There is nothing shameful in not being the best at solving unnerving problems at work but you will have to be honest about it. 13. Are you good at what you do? The employers do not expect you to be excellent in every skill they are hiring so many applicants for. They want to see your dedication and expertise in one single skill that you know better than anybody who has applied for the post. The moment you prove to them that there is something you have to offer that others can’t, you will become indispensable. Employers by nature, look for unique personalities and more frankly they somewhat want to see a reflection of their own skills in you. So also make sure that you are showing a lot of true potentials let alone giving equal attention to all of the interviewers. 14. What would be your alternative job option? Frankly, jobs at private sectors and companies do not promise permanent employment. Companies seldom outgrow the need for certain posts. But when they do, some employees have to be let go of. Now since they want to be in the clear, they would also expect you to see the matter maturely rather as a breach of loyalty to your long-standing service. This does not necessarily mean that the situation will arise but you need to figure out a way as an alternative to provide your family without falling apart emotionally if it does. 15. How confident are you? Confidence in the employees is among the foremost needs of a company. It is what the interviewers would first test you on. Some of us despite being confident in the daily walks of life have a tendency to fall out of a challenge when it comes to facing a bigger mass. Stage fright does not go hand in hand with the world of competition. Even talent comes after confidence. A person who is half as talented but has twice the confidence as you would be more preferable. To overcome your fears all you have to do is, learn to face them on your own because confidence grows with each flight. 16. Do you tend to be selfish? Being selfish never works out well for anybody especially at a place that runs on collective effort and teamwork. If you are naturally selfish then try to change for the better. Nobody likes a person who puts his needs before anybody’s. Changing this behaviour does not only mean changing your selfish attitude for others but also for yourself. It makes you happy to think that you have actually done something nice for someone without thinking about yourself. That is the kind of mentality, companies expect to find in their employees. Are you trying for any other jobs? Choose any one , money or work? Why? Will you be ready to retire right now, if you have saved up enough money? State the difference between developer and programmer. Do you possess any blind spots? What are the things that makes you most confident? The above-given points are the basic self-analysis questions with best self-evaluation answers for self-assessment interviews that one can look forward to without getting a lump in their throat.